Adam Hull graduated from Pittsburg State’s College of Education nearly 14 years ago, but he remembers Teacher Interview Day like it was yesterday. He also can recall the days leading up to it: he was a bundle of nerves. “I knew one of the nine schools I’d scheduled interviews with could potentially be my employer and I recall sweating more than average and having a parched mouth,” he said. Which is why Hull, now a teacher at Pittsburg Community Middle School who hopes to one day become a school administrator, was only too happy to be part of a unique event Friday in the Overman Student Center: Teacher Mock Interview Day. 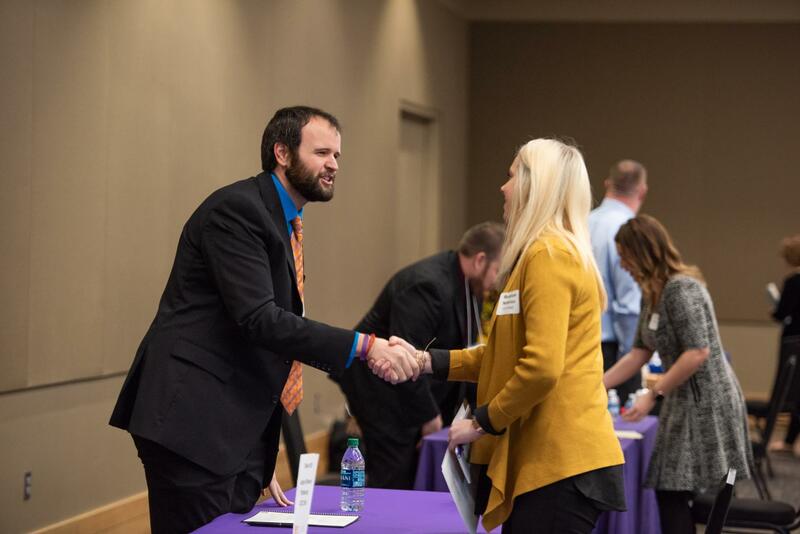 There, he and more than 30 other educators in this year’s Greenbush Leadership Academy helped prepare about 90 future teachers for actual Teacher Interview Day, which is planned for Feb. 12. It resembled a speed dating session. A clock was set to countdown 15 minutes, and seniors in the College of Education fanned out among tables to meet with educators from school districts around the region. Dressed to impress and carrying copies of their resumé, they shook hands and answered questions about themselves, then listened to constructive criticism and helpful pointers. Among them: Bailey Henry, a senior from Wichita. “I’m nervous about real Teacher Interview Day, but I feel like this is definitely going to help me get ready for it,” she said. Senior Michael Neatherlin, of Pittsburg, agreed. 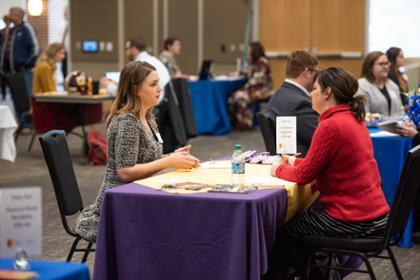 The actual Teacher Interview Day, a cooperative effort by the PSU Office of Career Services and the College of Education, will be held on Feb. 12 in the Weede Physical Education Building. It annually draws school administrators from 100 school districts in Missouri, Kansas, Arkansas, and Oklahoma, all seeking qualified candidates to fill vacancies.